Villagers completing repairs on bathhouse in Labun, Russia. Repairs, made possible by funds advanced by the Joint Distribution Committee, enabled these Russia Jews to use the bath again after several years in disrepair. Use of this photograph courtesy of the American Jewish Joint Distribution Committee. 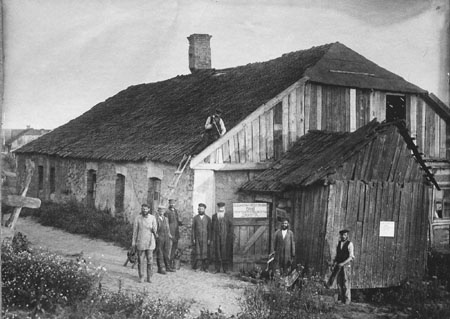 This web site is dedicated to the study of Jewish family history in the town known in Yiddish as Lubin, now called Yurovshchina, in what is now Ukraine, but formerly part of the Volhynia Gubernia of the Russian Empire. This site is hosted at no cost to the public by JewishGen, Inc., the Home of Jewish Genealogy, a non-profit corporation. If you have been aided in your research by this site and wish to further our mission of preserving our history for future generations, your JewishGen-erosity is greatly appreciated.